When the time come into the new year, is a good time for us self-review our business progress, and what you have achieved and yet to complete in the past years. You may have the plan to develop your business in a wider market or even to multinational or increase your business productivity. No matter how making a new year’s resolution is one of the ways that will impact your business success. 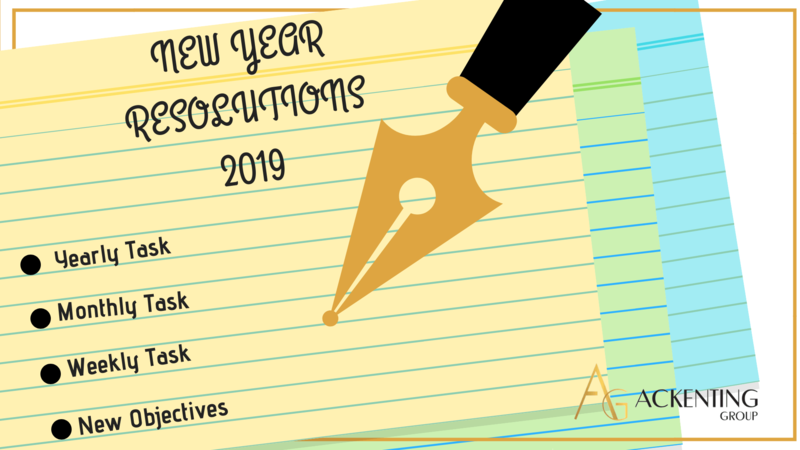 If getting your business in tip-top shape is your priority, consider here are the following accounting resolutions for 2019. Take an evaluation of your business in the year 2018. Any significant grow or shrink your business? How the revenue and profit ratio in the year 2018 and compare to the previous year. To find out the sales figure trend and the monthly result, does it match with your sales forecast which you have planned? Were the operation and general expenditure impact on your profit figure? Here are some of the objective and question that you need to find out and determine how to make it better in 2019. By reflecting the result in 2018, should help to find out how your company has changed during the year. If there isn’t any improvement, you and analyze the figure in your financial report in order to discover the reason behind. Books provide not only in words form and instill knowledge to the reader, but also record figures of your business cash flow and transaction. To get alert of your business financial condition, monthly checking (weekly is the best)of your cash book will help your aware of what’s going on with your money. This practice will help the business owner to manage their cash flow effectively. Reviewing your cash books weekly will help you to track your transaction easily, estimate your revenue earned and expenses incurred on your business. If there are any issued arises, you can easily find out and have the chance to recover it in a timely manner. Collect Unpaid Invoices and Plan for Business Expenses. During the course of 2019, business owner also needs to be aware of the unexpected business expenses are likely inevitable. Prepare for unforeseen cost earlier than later can prevent you from the cash flow running low when some go wrongs. Therefore, planning on the expenses always have to make some allowance for the unpredictable cost. Taxes can be a huge cost and downside for running a business. However is an obligation for all the business owner to pay their tax and filed according. Therefore seek for professional taxation adviser is one of the ways to secure your business in complying the federal tax regulations. A tax professional can advised you on how to maximize the tax benefit and filed your taxes in a proper manner without breaking the tax regulation. Beside that tax adviser is definitely the one will update you about new tax laws and codes that may impact your business’s bottom line. Do you ever feel like time have run out in your days to get all the task done? This may because you have to try to do all the complicated company’s accounting task by your own self. By effectively increase your company productivity, you might need to seek to outsource accounting function to handle the financial tasks. Outsourcing accounting tasks can increase both your business’s efficiency and performance by decreasing your overhead cost, saving times, giving access to best financial advice, manage your financial report in a timely manner and provide better security and privacy.